We have organized the OWA FAQs below by topic. Click on the category name below to go directly to the list of FAQs for that category. Why does my OWA session time out? A lot of companies use an OWA session security solution such as OWA Forms-based authentication, ISA Forms-based authentication, RSA SecurID, Messageware TimeGuard, or SafeWord from Secure Computing. These solutions all have an inactivity timeout feature which logs users off OWA users after an extended period of inactivity. Note that working on a new message is not seen as activity by OWA -- you have to be moving in the main OWA frame to be active. How can I configure per-server segmentation? Locate the following registry subkey: HKEY_LOCAL_MACHINE\System\CurrentControlSet\Services\MSExchangeWeb\OWA. In the New Value #1 box, type DefaultMailboxFolderSet. Select Decimal and type the value that corresponds to the OWA features to be enabled. Refer to Microsoft article http://support.microsoft.com/kb/833340 to calculate the segmentation value. Note: In a front-end / back-end environment, segmentation settings must be made on the back-end server. For additional information about the segmentation attributes, refer to Microsoft’s article below.http://support.microsoft.com/kb/833340. How can I paste / embed images in to OWA messages? You can embed images using Outlook, which actually stores images as attachments, making them available for recipients using OWA to see. There is a Microsoft knowledgebase article, available below, which explains how to paste an image into the OWA signature. The workaround does not always seem to work and is not supported by Microsoft as an official solution. How do you change the Outlook Web Access Logon Page? Use HTML and WebDAV to Create a Customized Web Program. Why does the OWA Inbox not refresh correctly on Macintosh clients? OWA on MAC browsers may cache OWA content since the last refresh, as a result, new mail arriving in the Inbox may not show the content in the preview pane until the Inbox is refreshed. Why can viewing an OWA attachment on a client machine be a security risk? When viewing an OWA attachment on a client machine, a copy gets saved in the cache of that machine. If this computer is shared or a public terminal, (such as a kiosk, library etc) the attachment can be viewed, copied and saved by by unauthorized users. There are third party add-ons, such as Messageware AttachView (www.messageware.com), which offer secure web access to OWA attachments by converting attachment files into secure web pages for over 300 file formats, providing secure access to attachments without the need of the application on the local computer. Why does mail appears to be missing when a new OWA session displays the view of the folder that was used last in an earlier session? When users login to OWA they may see the content of the last accessed folder as their Inbox content, this may cause confusion for the users. A workaround allows the Inbox folder to be set as the last accessed folder for all connections. When I send a document from within a Microsoft Office application such as Microsoft Word, Outlook Express comes up. How can I set up my Default Mail Client to use OWA? To set OWA as the default mail client, you need to use a third party add-on, such as ActiveSend from Messageware (www.messageware.com). ActiveSend gives users the ability to set OWA as the default email within desktop applications, enabling the SendTo and MailTo functions, hyperlinks in web pages. How can I restrict OWA address searches to multiple organizational units? The below Microsoft article describes how to permit OWA users search address books based on multiple organizational units or specific address lists, rather than being restricted to just their organizational unit or one address list. How can Exchange 2000 OWA users access Exchange Server 5.5 Public Folders? To access Public Folders on Exchange 5.5, a Connection Agreement must be made with the Exchange 2000 computer and the Exchange Server 5.5 public folders must be replicated to the Exchange 2000 computer. Why are all my emails transferred from my OWA inbox to my Outlook inbox when I opened Outlook? My OWA inbox is empty after using Outlook. Your Administrator seems to have setup the POP3 or IMAP service on the server. These services hold emails on the server until you connect using Outlook. All emails are then pulled down to your desktop leaving your Inbox empty. OWA connects to the mailbox on the server showing you all of your new emails since the last time you connected using Outlook. If you do not want your emails to be downloaded each time, ask your helpdesk if you can set up an Outlook connection directly to the Microsoft Exchange Server, not using POP3 or IMAP. Note that you can only set up this type of connection while you are in office. Is there a thesaurus in OWA 2000? To use a thesaurus in OWA 2000 your company needs to purchase third-party software from Messageware called Plus Pack. This product enhances OWA functionality by adding features such as the signature option, a spell check, thesaurus and an enhanced address book. Once it is installed on the server, the thesaurus icon will be visible in the new message toolbar. How can I use the spell check option in OWA 2000? To spell check messages in OWA 2000 your company needs to purchase third-party software from Messageware called Plus Pack. This product enhances OWA functionality by adding features such as the signature option, a spell check, thesaurus and an enhanced address book. 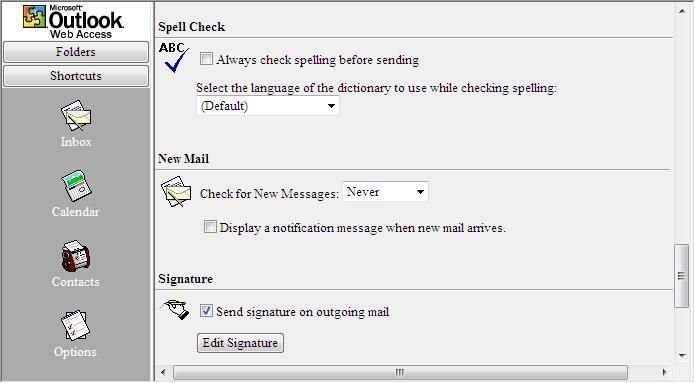 Once it is installed on the server, you can enable the option to Always check spelling before sending and chooses your spell check language from the OWA Options page. How do I add an automatic signature to my OWA messages? To add an automatic signature to your messages your company needs to purchase third-party software from Messageware called Plus Pack. This product enhances OWA functionality by adding features such as the signature option, a spell check, thesaurus and an enhanced address book. Once it is installed on the server, you can create your signature from the Options page to be included with all outgoing messages. What is the difference between Reply, Reply to All and Forward? The reply and forward buttons are ways to respond to messages. The reply button allows you to send an email back to the person who sent the email. The forward button allows you to send the email to someone who was not in the TO, or CC lines of the email. Use Reply ( ) if you want to write back to John about the email. Use Reply to All ( ) if you want to write back to John and let Jim and Nancy see your response. Use Forward ( ) if you want to send John’s email to Amanda, to let her know what John written. What is the BCC line for? How can I sort my emails by the person who sent them to me? You can sort your emails by clicking on the column headings including From, Subject and Received. This will sort the emails based on the column selected. To sort your email by sender, press on the FROM column title. To change the order from ascending to descending, click on the FROM column title a second time. How can I troubleshoot not being able to login to OWA? When incorrect, you will be prompted to re-enter your password several times in a row without getting access to your mailbox. After three tries you will see an error indicating that you are not authorized. If you cannot get into OWA, try connecting to OWA using another browser. For example, if you are using Internet Explorer, try using Firefox or Netscape and visa versa. Go to another computer and try logging into OWA using your account, Can you connect? Check with the people around you to see if they are also having problems. To take a screenshot of any errors you get by pressing the “Print Screen” button on your keyboard. Once you press the print screen button the picture will be on your clipboard. Open a Microsoft Word document, right-click on the whitespace and press Paste. Gather up as much information about what you are seeing so that you can provide it to your Help Desk or System Administrator. How can I access my email from home using Outlook 2003 or 2007? You will need to speak to your Exchange Administrator about setting up a VPN or RPC over HTTP connection for you. Refer to the Microsoft knowledgebase article below for more information. ActiveSend also includes the ability to save an encrypted username and password, and toggle between mail accounts so you can change the default email from OWA to Outlook, for example, if you are using a notebook both in and out of the office. How do I set up my OWA account? In order to access your email using Outlook Web Access, your company’s Exchange Administrator (or IT department) will need to give you the OWA URL to log in to. They will also provide you with your username and password. How can I set my Out of Office response in OWA? The Out of Office Assistant sends an automatic email to anyone who sends you an email while you are not in the office. You can set up your out of office message using Outlook Web Access (OWA). Go to the Options page by pressing the Options button on the bottom left side of the OWA window. Under the Out of Office Assistant heading select I'm currently out of the office. Under the AutoReply only once to each sender with the following text: type in your out of office message. Press the Save and Close button at the top of the OWA window. How do I log off OWA? To log off your OWA account, click the Log Off button at the bottom of the shortcut menu. To see the shortcut menu, click the Shortcut button on the upper left-hand side of the OWA window. This will bring up a new message window where you can type into the To, Subject and Body of message. When you are finished, press the Send button in the top left hand corner of the New Message Window to send the message. When you are finished, press the Send button in the top left hand corner of the New Message Window to send the message. Using the address book, how can I add multiple people to a new message? If you are trying to send an email to multiple people, you can start by opening the address book from the To button. The Find Names Address will open in a new browser window. Search for the first person using the search fields, click on the name once and then press the To, Cc or Bcc button. The address book will remain open and let you continue with your search until you press Close. There is a way to quickly address a message to multiple people, this is by holding down the Ctrl keyboard key and clicking on each name that you want to send the email to, see the example below. To do this, your company will need to install a product called Messageware Plus Pack which is available from Messageware Incorporated (www.messageware.com). Plus Pack adds features to Outlook Web Access to make it more like desktop Outlook. In the address book, how can I search Contacts by default instead of the company address book? Open the OWA Options page by selecting Options from the Button Bar. Scroll down to the Contact Options section and set the Check names first in: section to Contacts. Press the Save and Close button at the top of the page. How can I find someone in my address book? Open the address book from the To button in a new message or the address book button at the Inbox toolbar. Fill in one or more of the search fields such as First name, Last name or Department. Press the Find button to find the person. To address a message to the person click on their name and press the To, CC or BCC button at the bottom of the address book. In the example below Sam Powers was added to the TO line of a new message using the address book. How can I delete a meeting from my calendar without deleting the reoccurrences or series? To delete just one occurrence of a series of meetings, double click on the appointment to open it and select “This occurrence”. You can then click the “Delete” button (X) to delete only that day’s meeting. How can I book and all day appointment on my calendar? Create a new appointment and check the “All Day Event” option. After saving the appointment it will show at the top of your calendar. Anyone trying to book a meeting with you will see that you are Busy or Out of Office all day. How can I get my calendar to show my working hours? You can customize when the work week begins in the options folder along with the time when the work day starts and ends. In OWA, go to the Shortcuts \ Options page. Scroll down to the Calendar Options section. Set Day start time and Day end time. Press the Save and Close button at the top of the options page to save the settings. I am not getting reminder pop-ups for my meetings, where can I turn on reminders? Scroll down to the Reminder Options section. Put a checkmark beside Enable reminders for Calendar items and optionally, beside Play a sound when a reminder comes due. You can also change the time before a reminder will pop up. The default value is 15 minutes so if you want to be reminded 20 minutes before your meetings you can change this setting using the Default reminder drop-down menu. When viewing an OWA attachment, a copy gets saved in the Temporary Internet cache of that computer. If this computer is shared or a public terminal, (such as a kiosk, library etc) the attachment can be viewed, copied and saved by unauthorized users. There are third party add-ons, such as Messageware AttachView (www.messageware.com) offering secure web access to OWA attachments by converting files into web pages for over 300 file formats. AttachView lets you view attachments without the need for the application on the local computer.